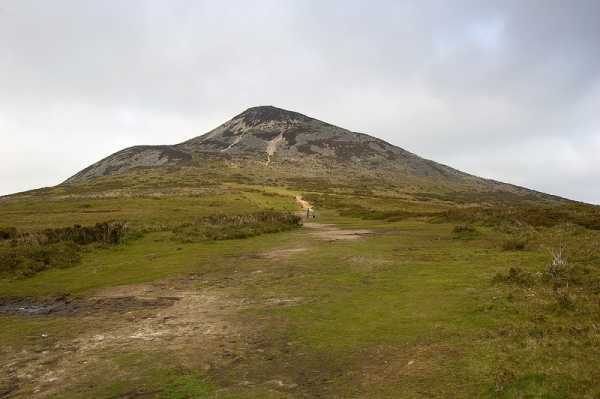 The Great Sugar Loaf is a very distinctive hill that towers above the small village of Kilmacanogue on the N11 Dublin – Wexford road. Conical and pointed, it is the volcano that never was. (Many people believe it is an extinct volcano but it is in fact Cambrian quartzite) But what is important is the fantastic shaped hill that is present now. It appears as a smaller version of Croagh Patrick. Despite its rock-strewn steep upper slopes, the hill is easily climbed. (Although the final 30 metres ascent require care). 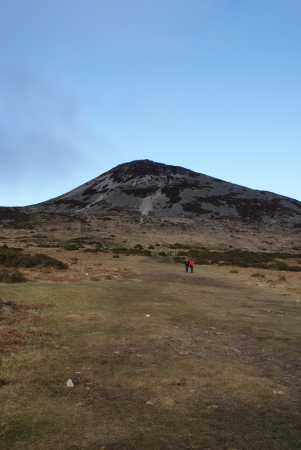 The relatively easy ascent, combined with its close proximity to Dublin, means that the Great Sugar Loaf is climbed by thousands of people a year. It is surely one of the most famous hills in Ireland, and it even featured in the opening credits of TV soap Glenroe back in the day! 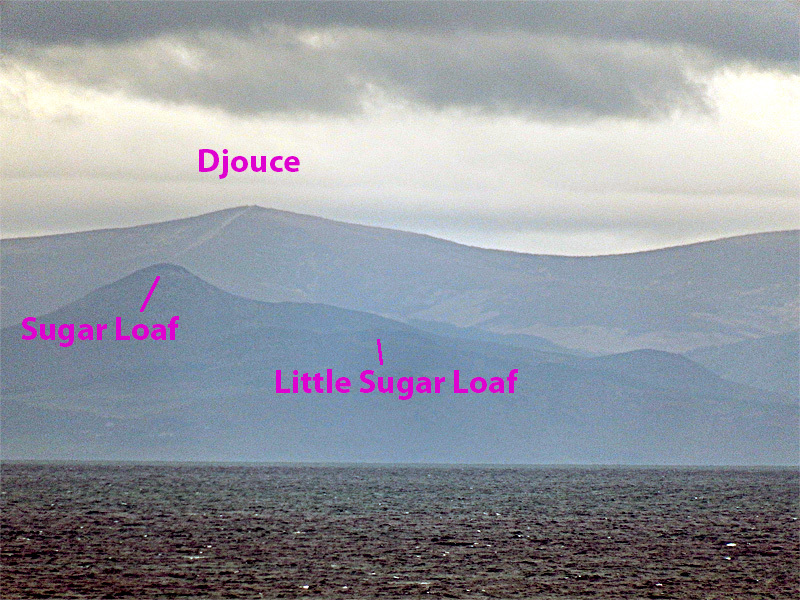 The Sugar Loaf commands fine views, especially across the coast and even the mountains of Wales are easily visible to the naked eye on a clear day. A car park at 235 119 A will knock a couple of hundred metres off the ascent. A clear track leads up grassy slopes before contouring around the hill as it rises into the rocky upper slopes. The final rocky scramble might require steadying hands as you haul up a short steep gully. Car park to summit can be walked in about 45 mins on average. Another route, with less usage, more climbing and more rugged quartzite slopes, starts from the small car park O2436 1410 B beside the Fitzsimons Park GAA ground which can be reached from Kilmacanogue and the N11. Picture from simon3 : Snowdon view from the Sugar Loaf. Picture: Snowdon view from the Sugar Loaf. Occasionally, through the murky misty air above the Irish Sea there emerges a view of Wales in higher parts of Wicklow or the Dublin Mountains. And so it was on 26th December 2017 that this view of Snowdon 1085, appeared around 150km away. Usually what you can see from this part of Wicklow is the distinctive shape of Yr Eifl (560m) which is on the Llyn Penisula and is a good bit nearer. Like Snowdon it appears as two summits, the rightmost being higher. However you can tell it apart from Snowdon because it appears steeper and the left peak Yr Eifl N has a visible vertical cliff to the left caused by quarrying. Had Yr Eifl been visible it would appear to the right of Snowdon. Picture from simon3 : Djouce from the sea. Picture: Djouce from the sea. Occasionally you hear that the track wear on Djouce is so bad that it can be seen from Wales. Maybe so, but then it is hard to see any part of Ireland from Wales. 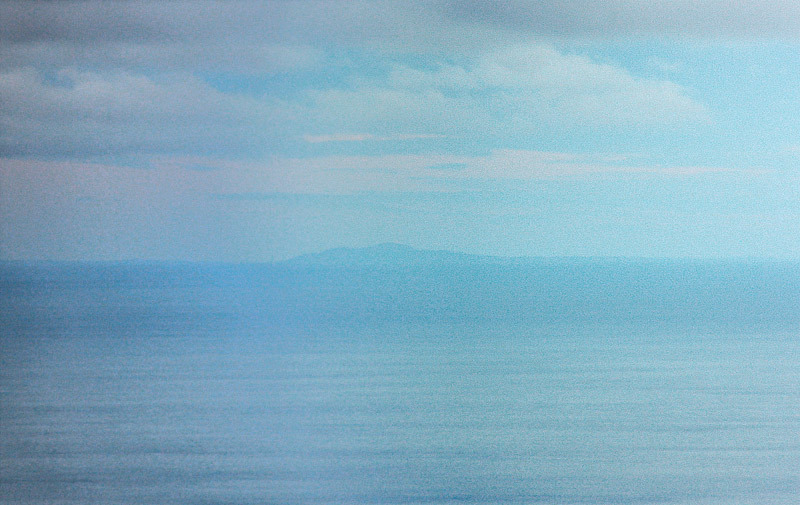 I was curious therefore to look at this picture of Djouce from very roughly 10km out of Dublin port. This was always going to be a very difficult weekend for me, sandwiched between two delicious Navan Hillwalker's outings (Mournes last Sunday -Wicklow next). Poor concentration. Weight gain. Irritability. Loss of libido. Urgency. Frequency. Flatulence. Alopecia. All the usual symptoms. I needed a fix. But I couldn't simply hare off on my own up another great mountain. After all I'm joint head of the family (according to the Constitution). They are entitled to some meaningful contact. Hmmm. Then it came to me. Bring them too! At least all except the eldest who's away. Given that our youngest lads are aged 4 and 6 we needed a mountain that would be accessible and not overly challenging...but with worthy views at the summit. The answer was the Great Sugar Loaf. After a surprisingly easy trip from Meath via the M50 we arrived at the well trodden base. Model planes were buzzing about. Then we had to get past the motorcyclists (who seemed to be aged between 8 and 12). Peter (4) quickly tired on the lower slopes which was exactly what I had hoped for: I carried him up "piggy back" style, loving every moment of the suffering, my mind totally fixed on next week's Navan assault and the need for preparation. When we reached the shoulder we faced a tricky little scramble up a steep stoney path to the summit. 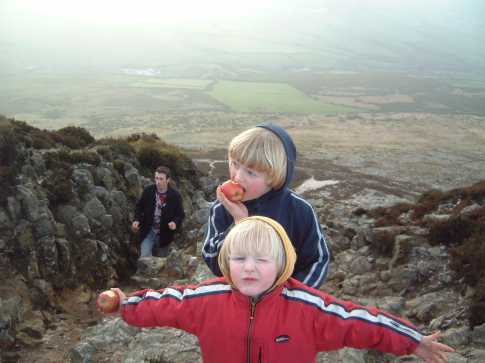 I was thrilled when the two little lads insisted on attacking the route like a pair of mountain goats. God bless them...you could see the magnificent Vertigo genes vibrating in their little limbs!! How proud I was as they munched their sambos and slurped their soup at "the top of the world". Now in case you think we're not safety conscious I want to assure you that the little lads were carefully monitored by three "big people" at all times. A great outing. Okay it would have been better if the mountain had been slightly less busy than Grafton Street, and if I could have taken pot shots at the Model Planes and the mad cyclists...and if the mountain wasn't so damaged...but its handy, and its perfect for kids and the views are stunning. So...hey...you can't have it all! !